Oh Maine, I am truly in love. What was it that made me fall in love so quickly? The charm, the food (lobster, clams and more), the lighthouses, the calmness of the bay, the sunrise, the sunset, the view of the milky way, the smells of salt, and the adventures you provided. I loved our time in Maine. Steve might find solace and peace at a lake, with his fishing pole, but for me, give me a beach, a blanket, and a warm hot chocolate, and I am happy. 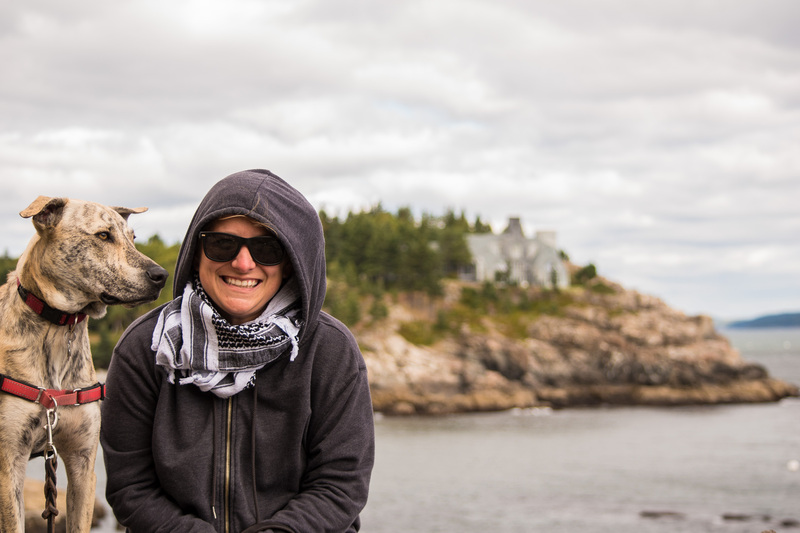 We decided to splurge on our stay in Bar Harbor (or as the locals say, “Baaaaaa Haaaaabaaa). 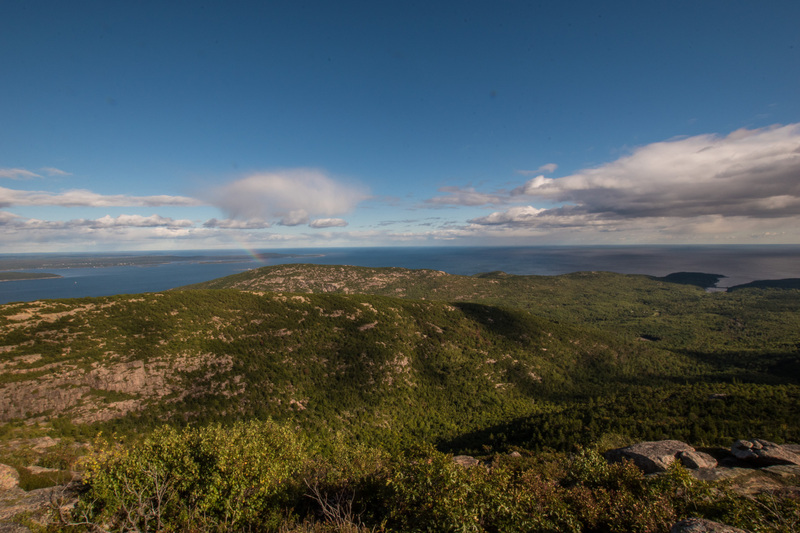 The town of Bar Harbor is a Bed & Breakfast place, and can be pricy. 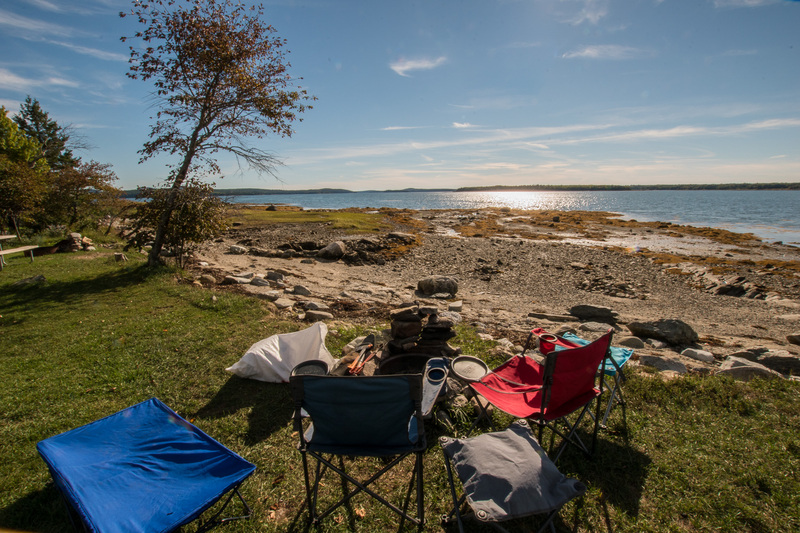 We had the option to stay further out of town for cheaper, but instead we chose to spend the money for a Bar Harbor campsite, and paid a little more for a site right on the beach. 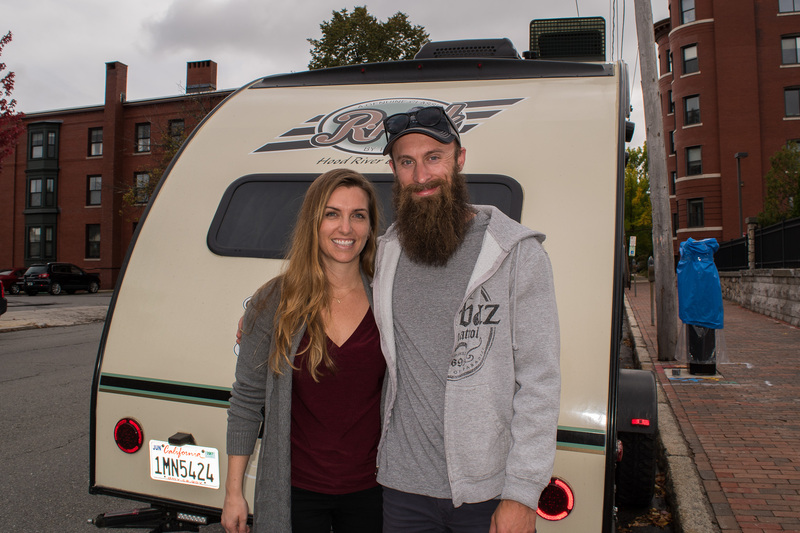 It felt romantic, sweet and lovely – and it was a KOA! 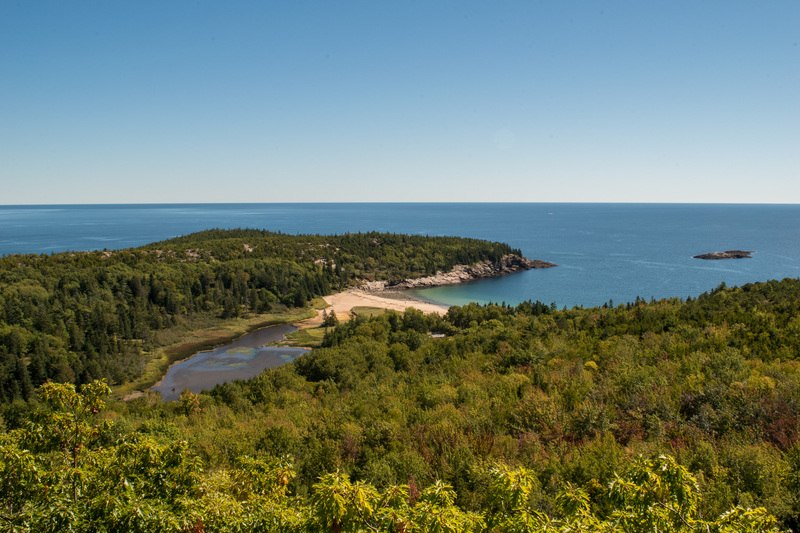 We couldn’t believe how amazing our site was, plus the location was perfect – just a 20 minute drive to Acadia National Park. We arrived at our campsite around 6:30 just in time to see the sunset on the bay. We couldn’t believe how cold it was. For the past 40 days, we have been in heat, and used to wearing shorts and a tank – Bar Harbor was in the 50’s and we were cold. 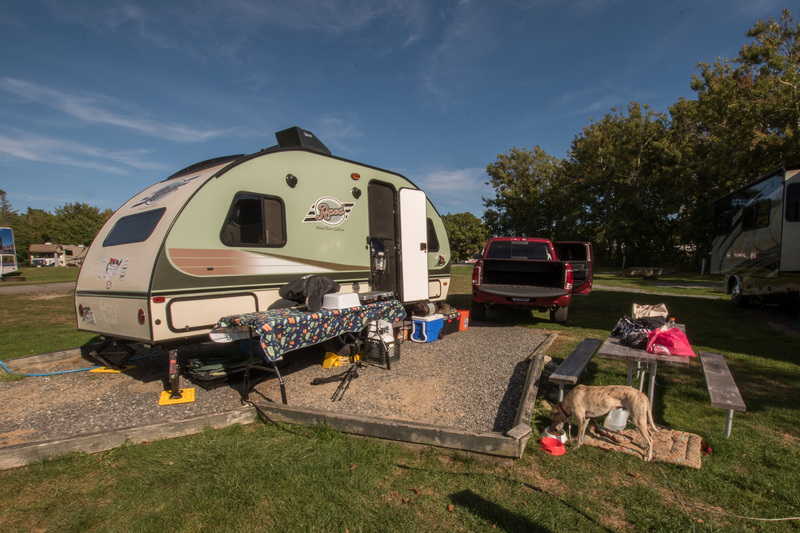 Our KOA didn’t have fantastic water pressure, which was unusual for us. We also noticed it was the first KOA we have been to that was sold out. It was jam packed with people. Overall, we were extremely happy with our stay, and would go again. 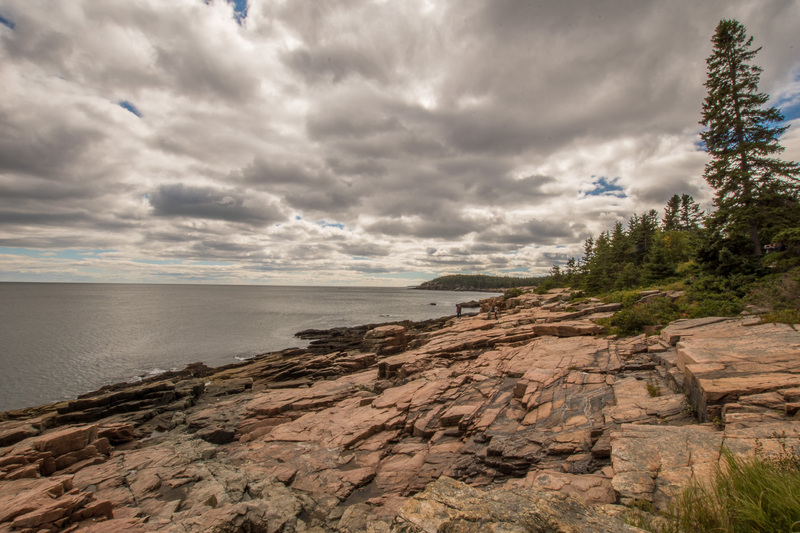 On Sunday we gathered our hiking gear, picnic lunch supplies, Sparky’s gear, and headed to Acadia National Park. Our first stop was the Hulls Cove Visitor Center. By 10:00AM the Visitor Center was packed with travelers. We grabbed our map, some post cards and tried to get out of the hot mess quickly. They do not offer hiking maps at the Ranger desk. Instead, they offer hiking books/maps for $5.00 at their store. We decided to instead download a free App, Chimani Acadia. This was a great decision – it provided hiking maps & descriptions, as well as overlook descriptions to our scenic loop drive. 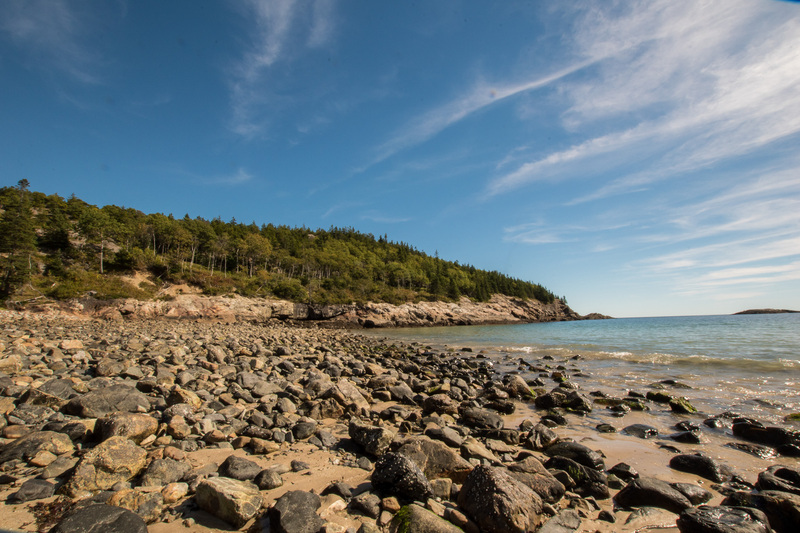 Acadia National Park is has it all – sea, tide pools, woodlands, lakes, ponds, and mountains. This also provides a diversity of wildlife – seals, birds, bats, red fox, white-tailed deer, green snakes, and even moose. The landscape varies from areas of the park, all thanks to the different geologic processes. Cooling magma, glaciers, and shoreline erosion all contribute to the unique beauty of Acadia. After our quick stop at the Visitor Center, we began the scenic loop drive on the main island (there are three sections total). The 27-mile Park Loop Road gives you the sights of lakes, mountains and seashore. 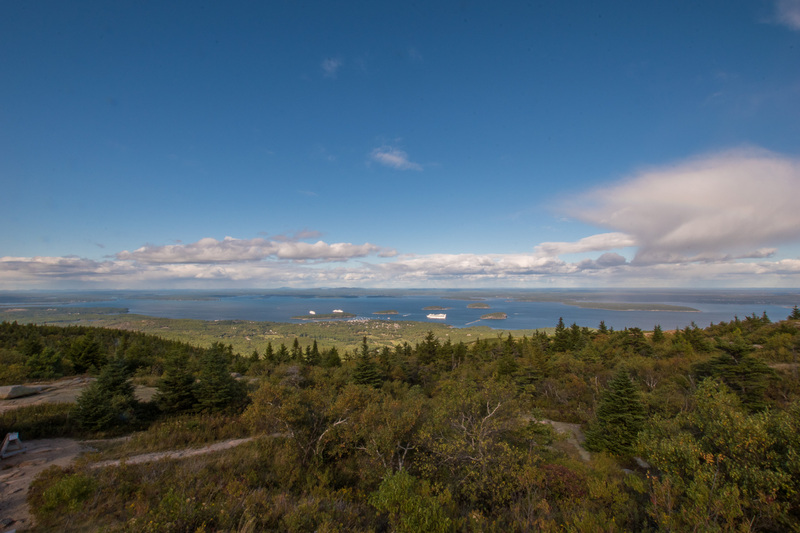 It also takes you to Cadillac Mountain, where you get panoramic views of the island and coast – and also can be the first in the country to watch the sunrise. We enjoyed seeing overlooks and taking small walks to the rocky shoreline. Our first major hike (but really, it was a stroll along a pathway) was the Ocean Path Trail. 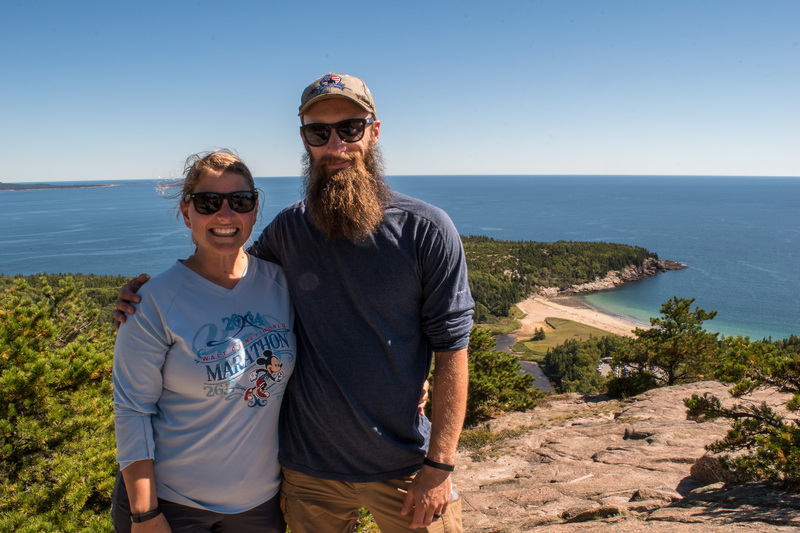 We had read several blogs that said this trail was the quintessential path to do while you visit Acadia. 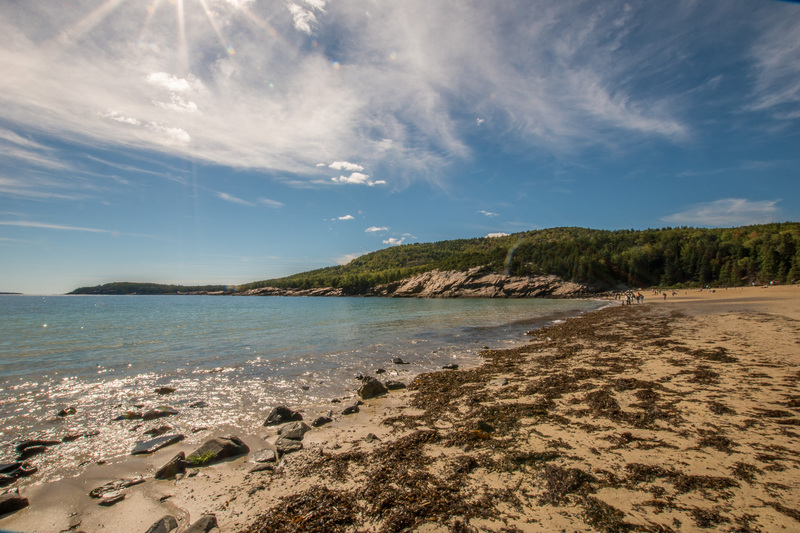 It gives you the opportunity to see what Acadia is known best for – their rocky, picturesque shoreline. 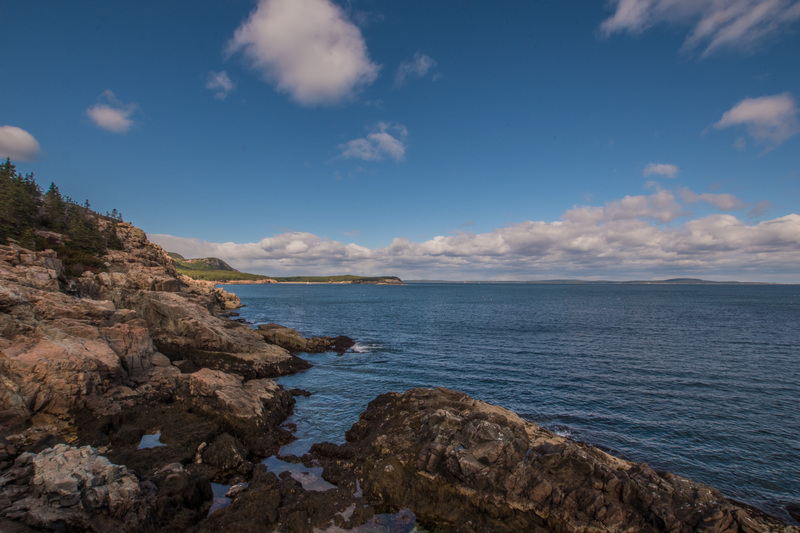 The trail leaves from Sand Beach and goes to Otter Point and totals 2 miles in length – 4 if you make it a round trip. It is the MOST popular trail, and because of this, parking was challenging. Everyone tries to park as close as they can to Sand Beach, which we attempted to as well. Then we soon learned that more parking lots exist along the trail. We parked about a quarter mile in, and decided to walk the trail till we felt like turning around. Every 20 feet on the trails are mini trails that lead to the rocks. We walked to many rocky overlooks, and took fantastic shots. 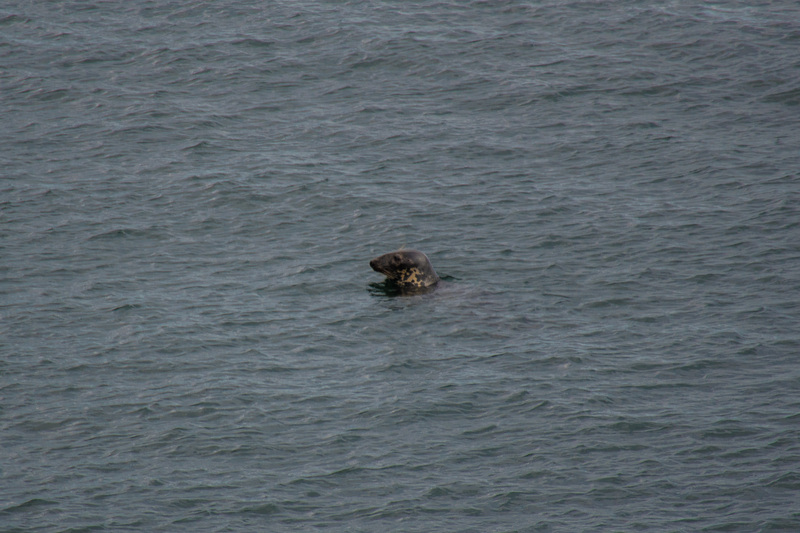 We got extremely lucky and saw a group of Grey Seals snacking on some fish. We went back to our car, grabbed our lunch, and picnicked on the rocks. 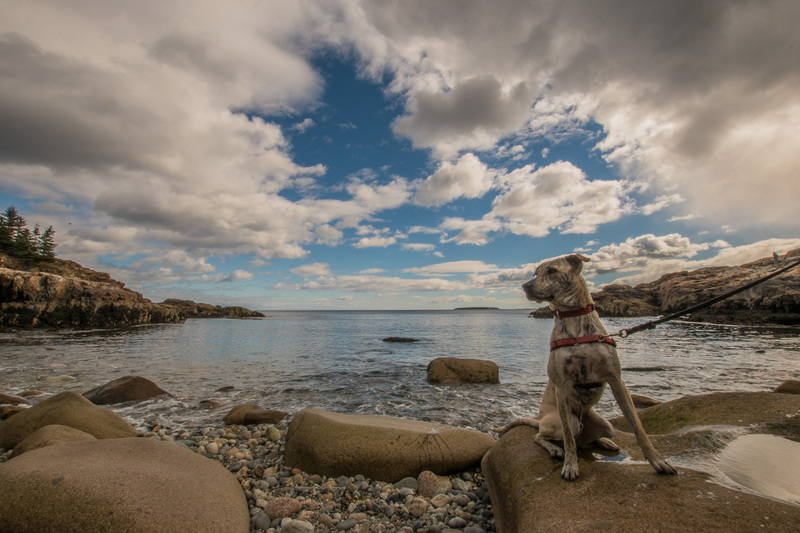 Acadia is one of the few parks that allow you to bring your dogs on most trails. The Ocean Path trail, although scenic, is also narrow, has two-way traffic and extremely busy. As much as we enjoyed having Sparky with us, it also led to some frustrations. After lunch we ended up driving to the parking lot nearest Otter Point and hiked down some more and took in some more beautiful views. As we kept driving the loop we paused and enjoyed time at Little Hunters Beach, a beach dogs can go on. It was not a sand beach, but a beach filled with spherical cobbles and boulders surrounded by beautiful cliffs. The rocks have broken off cliffs, and smoothed and rounded by constant tumbling in the ocean waves. This was Sparky’s first time touching the Atlantic Ocean, a photogenic moment indeed! Sparky was curious, but decided it was too cold to go all the way in the water. Instead, he enjoyed looking at the waves and running after them. Our next big stop on the drive was Cadillac Mountain. As I mentioned earlier, people travel here early in the morning to be the first in the country to see the sunrise. The mountain stands at 1,530 feet and gives the most amazing views of the island and sea. We enjoyed walking along the ridgeline and taking different paths on the top. Throughout our day at the park, Sparky was on stellar good behavior, and at least 20 people stopped us to ask about him. He lived it up, with wags, belly rubs and lots of kisses. One thing is for sure; Maine loves their dogs, especially rescue dogs. Before dinner we had to make a trip to their local Home Depot (only 30 minute drive away). The previous night was the first night we have EVER used our heater, and we learned it uses a lot of propane, which we have to pay for, and is quite noisy. We ended up getting a $30 space heater to use for when we have electrical (since electricity is “free” then) – and it worked PERFECT. Thank goodness! We ended the day with a trip to a local lobster shack, Down East Lobster Company. We ordered a sample of different foods – lobster rolls, steamed clams, and clam chowder! Everything was delicious and fresh. The clam chowder was not as creamy as they serve it in San Francisco, but the chunks of meat made up for that. We also had some local Maine beer. I tried for the first time, Blueberry Beer. It is a local Bar Harbor specialty. It tastes like blueberry wine cooler. It was okay, but I wouldn’t buy it again. Monday we decided to take Sparky to a local boarding care so we could conquer two of their four ladder climb trails. We took Sparky to Acadia Woods Kennel, which unfortunately was not a day care, but she assured us he would have plenty of time in the run yard. When we picked him up, he slept the remainder of the day and night, so it worked. Our first trail we did was the Precipice Trail. This trail takes you up 900+ feet in the course of 0.9 mile. This trail is closed during most of the summer because of Peregrine Falcon nesting. Steve and I have never done a ladder trail before, and weren’t sure what to expect. We had read in blogs that this specific trail was a must, along with the Beehive trail (which we also did). I wasn’t sure if I was in the right shape, wasn’t sure if it was similar to rock climbing, and if I would end up chickening out. Once we got on the trail, it started with a lot of scrambling. Climbing over rocks and more rocks. We soon got to our first iron ladders, drilled into the rocks. 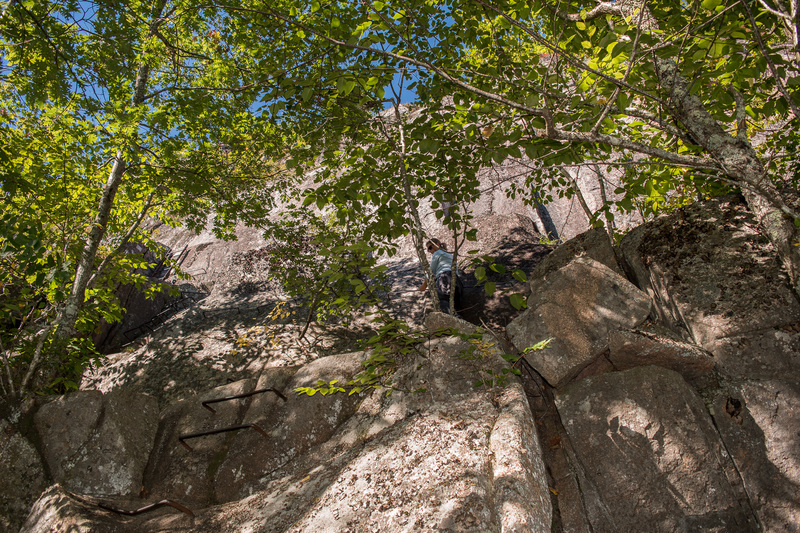 You got to experience the climbing the rock, without actually rock climbing. There were areas of the trail that was challenging. I would not recommend this trail to anyone who is afraid of heights, because you are walking along rock cliffs. 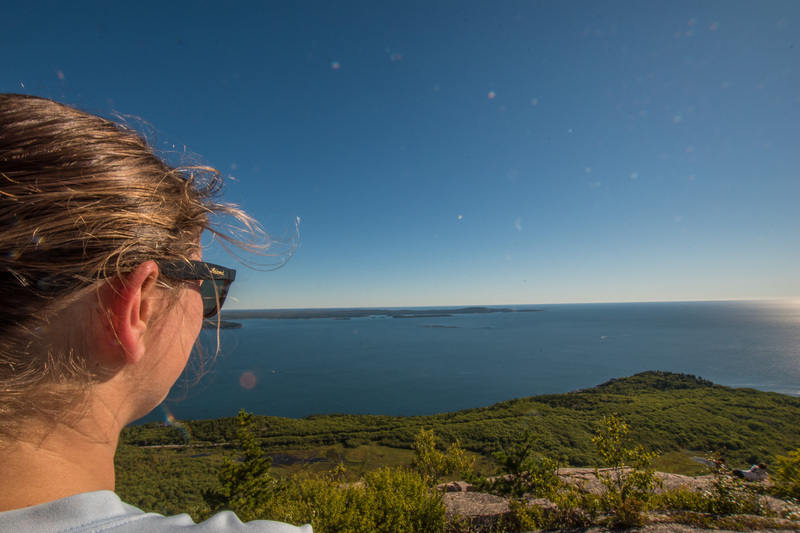 If you can handle the heights, and the cardio, you are rewarded with views of island, ocean, and Bar Harbor. Once you make it the mile to the summit, you have to take a trail down back to you car, we took the North Ridge trail, to Orange & Black trail, back to Loop road, making it a 3 mile hike. We were ready for lunch after our hike, so we picnicked at Sand Beach. It was nice to eat with the sound of ocean, the breeze, and the sun beaming down on you. I took a little snooze and it felt great. We headed from the parking lot to the Beehive Trail, our second ladder trail. This trail is 0.8 mile up 445 feet. This trail is the most recommended ladder hike, so it was busy. I would say this hike was easier than the Precipice trail, but still offered a challenge. The cliffs are a little bit more intense and again not recommended for people who hate heights. Once on top, we had to find a hike back down, so we took the Bowl trail, making this hike 1.5 miles. After the hike, we walked back to the beach, took a few photos, and decided to call it a day. Our legs were done, and we wanted to enjoy hanging out at our ocean front site. The weather was not cooperating that evening and wind gusts were between 20-30 mph. 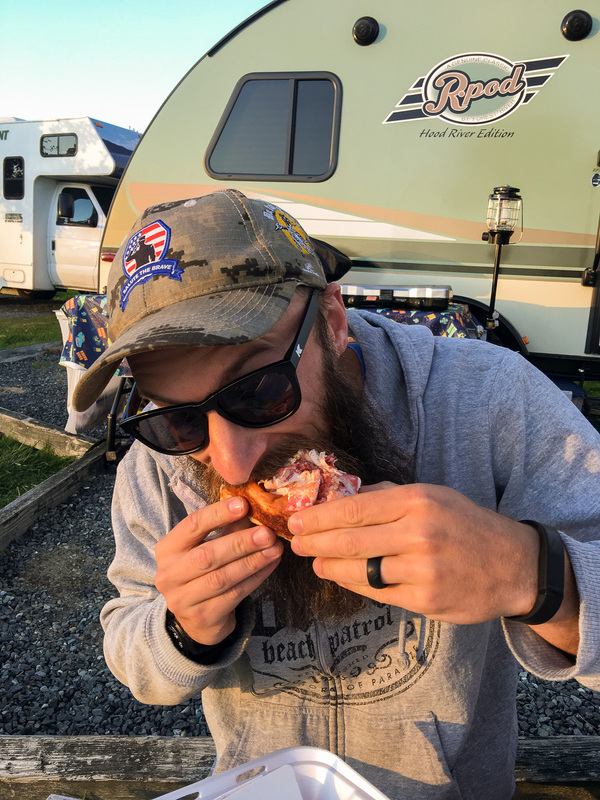 We tried our best to eat dinner by the fire, but when the wind started blowing my salad off my plate, I called it quits and ate the rest of my dinner inside the trailer. We knew it was going to rain in the morning, so we did as much packing as we could at night. Yesterday morning, it was raining as we finished packing and undocking the trailer. But we got out with mostly dry clothes. We took the 3-hour drive South to Portland where Steve’s friend, Deirdre, lives. We met with her for lunch near the hospital she works at. We enjoyed a loaded fried chicken sandwich with mash potato’s and gravy. It was great meeting Deirdre and I hope to see her again! Steve loved catching up with his old hockey mate! 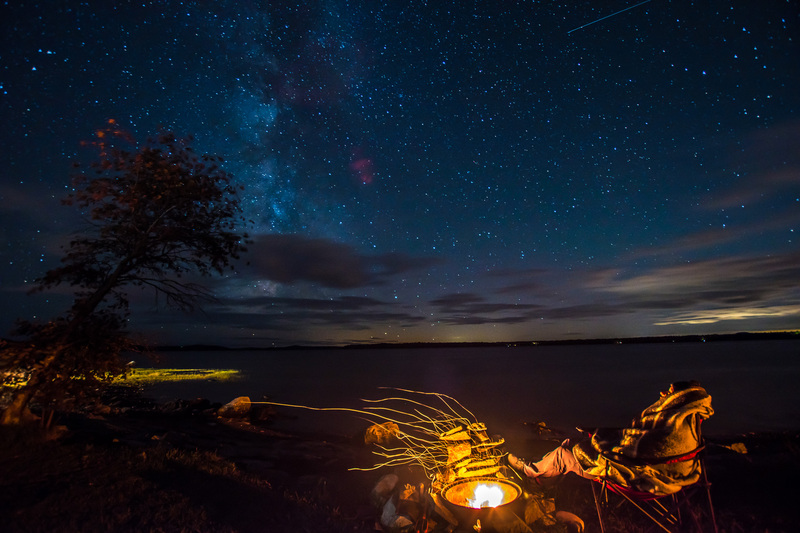 Maine is on our list to go again. I would love to go up further North to St. Croix International Historic Site. I would love to go to Nova Scotia. When we are in Acadia, I would like to wake up early to see the sunrise, we just didn’t luck out with morning weather during this trip. We are driving to my parent’s home in Springfield, Virginia. We plan on staying the night in Hamburg, Pennsylvania – at a Cabela’s! We do not have any sight seeing planned, but hope to arrive before noon on Wednesday. Steve will be traveling to the bay area on Thursday to check in with family, our cats, and to attend our friends (Peggy & Rachael) wedding. We plan on being in Virginia 2-3 weeks. We will be obtaining our visas for our international travel, getting Sparky settled in with my parents, visiting my family, doing some DC sightseeing, and getting lots of sleep. Stay tuned for more blogs posts & travels! We plan on being International November 1st!